A friend spoke good things about the pork noodles at Kui Lam in Taman Yulek, Cheras, and asked rif and I to get there before 10am. Good thing we listened to him, because the restaurant was almost packed when we got there at 9am. 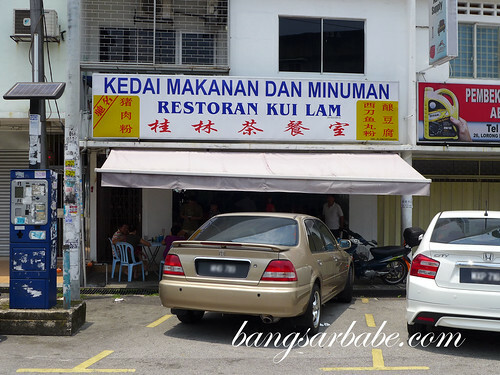 And by 9.30am, there was a queue outside Kui Lam. The menu is pretty extensive. Expect to find pork noodles with a variety of accompaniments such as pork ball, minced pork, pork lard … and the more exotic ears, liver, kidney and intestines. 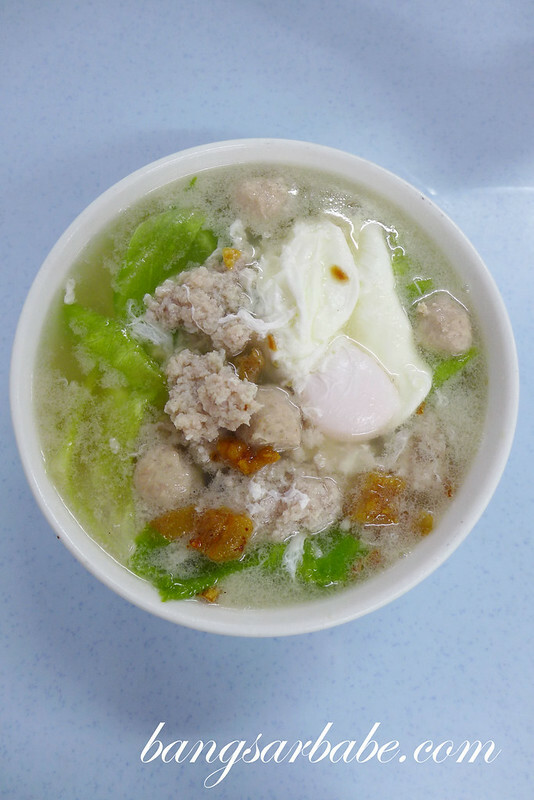 I’m an offal wuss; so pork noodles with just pork ball, minced pork and pork lard with an extra egg was good enough. rif ordered the same pork noodles but without the egg. Our noodles took about 15-20 minutes to arrive. That’s way better than waiting 45 minutes to an hour for the pork noodles in Subang. 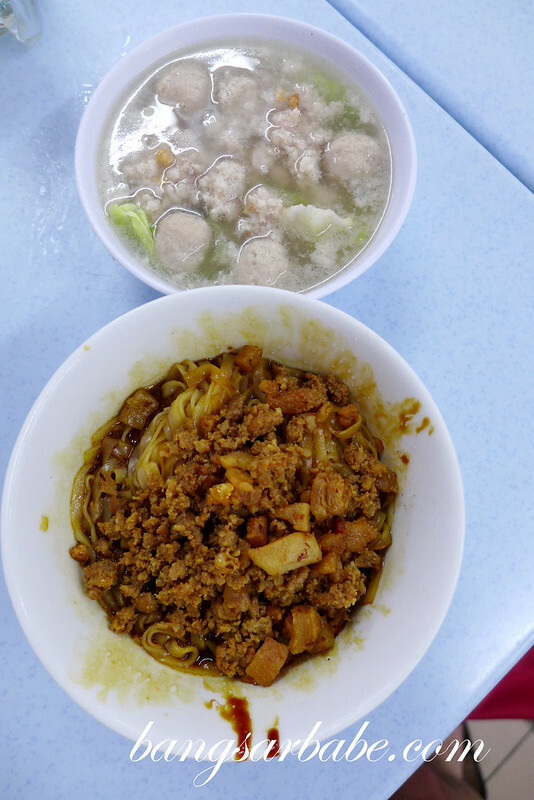 And each bowl came with a generous portion of minced pork and lard. Tastewise, the noodles were delicious. The soup had a good balance of flavour from the pork bones and seasoning. 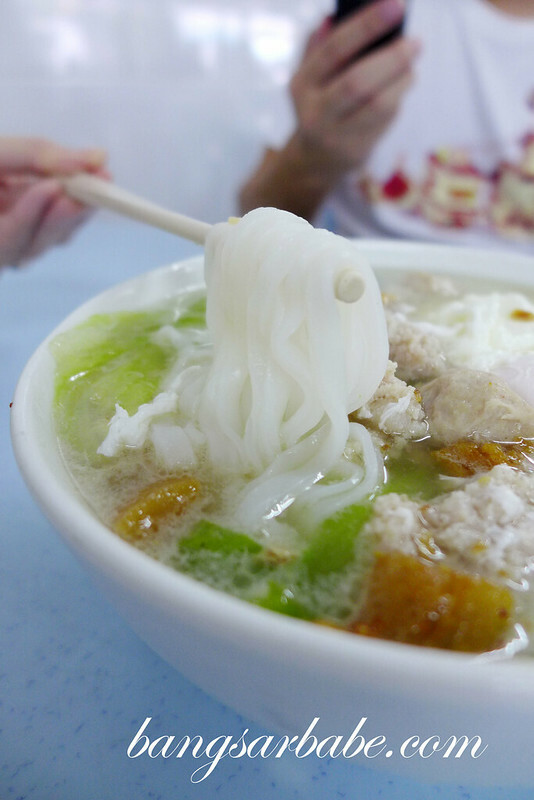 It wasn’t overly thick or cloying, and complemented the kuay teow well. I liked that the pork lard remained crispy despite being soaked in the broth. Between rif’s version and mine, I would recommend his as the extra egg altered the flavour of the broth slightly – it tasted less porky. The pork balls were also quite tasty, but nothing compared to the savoury minced pork and lard. Being my usual greedy self, I ordered another bowl of dry pork noodles to try. This was also very tasty. 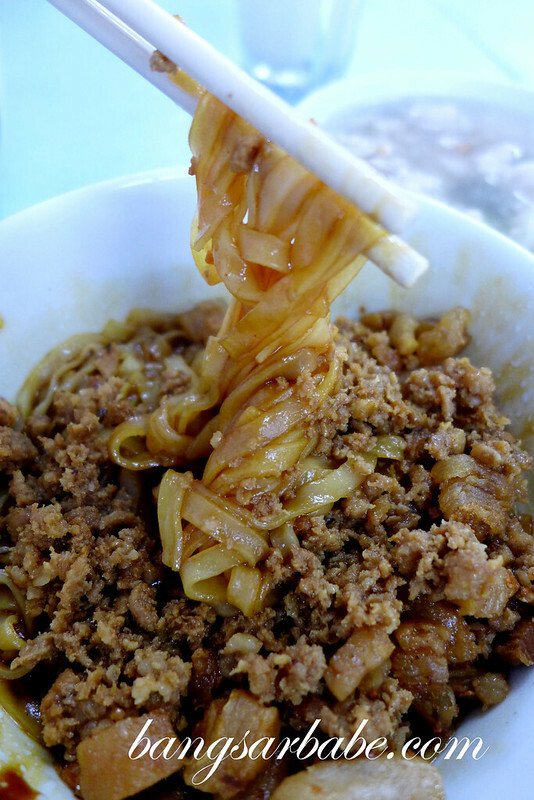 The noodles came laden with minced pork and lard. And when I say laden, I really mean LADEN. It was hard to spot the noodles beneath the heap of topping. With pork noodles, more is more. 😀 The kuay teow was well coated with gravy, with a good aroma and flavour from the onion oil and lard. 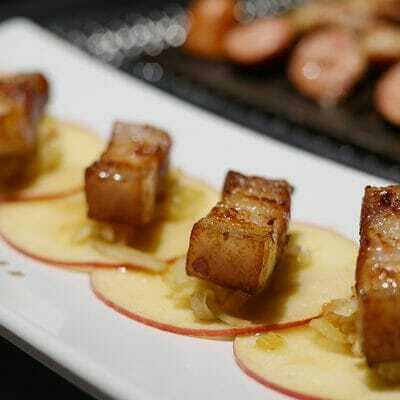 Each mouthful was savoury-sweet with a crispy note from the pork lard. Seriously good stuff. But this is going to cost you at least 4 hours on the treadmill. Well flavoured and tasty throughout! I’m glad we tried the pork noodles here. Now I know where to go for pork noodles if I don’t feel like waiting too long for a bowl. But make sure you get there by 9am. Otherwise, you might have to wait for 45 minutes (like the one in Subang) before you get your fix. Verdict: Tasty pork noodles with a generous amount of minced pork and lard. I’ve been very blessed to have good sponsors so I’m often prepared when there’s an occasion. Of late, I’ve been in to a lot of pink hence the pink dresses. At the W Bali 2nd Anniversary, I wore the Baroque jacquard satin dress from Azorias and added a black and gold belt to it. The dress has a full skirt with knife pleats; very feminine and chic at the same time. By the way, take part in the ‘Evolution of Suede’ Instagram Contest. Share pictures of your personal suede collection, Malaysian street culture or the design of the Suede for the future on your Instagram. Don’t forget to include the hashtag #ForTheStreet. The selected winner will get VIP invites to the finale party and a cool pair of Puma Suede! 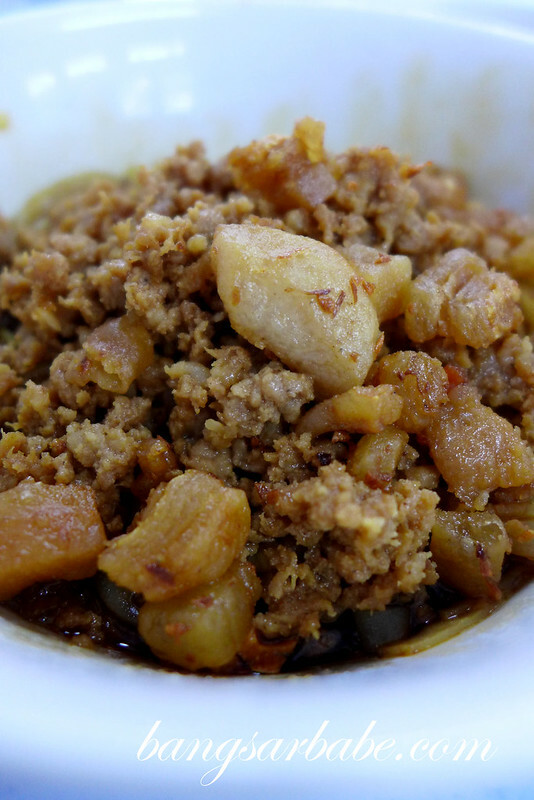 Oh gosh… look at the amount of minced pork and lard on the dry version! Does this coffee shop only sell pork noodles? Or there are other hawker stalls? True. Our crazy weather makes having hot soup very difficult. Like your last OOTD, very sunshine girl!